If I don’t get a bigger trailer to travel in, you’re going be some sorry! It was a dark and stormy night outside a small cape on the rugged but beautiful coast of Maine. As smoke curled from the decaying chimney, ice crystals formed on the poorly insulated windows of the quaint weatherworn cottage. The phone rang; brinnng, brinnng…..it rang out with the urgency that can only spell trouble for two innocent citizens in the tiny village of Crabapple Cove. But alas, half of the couple was a very poor spelr and did not immediately grasp the severity of this jarring intrusion. The clattering instrument shattered all peaceful reverie for the innocent folks snuggled in recliners by a roaring fireplace while squinting at the glowing screen of their iPad’s. Their quizzical faces adorned with the seasonal barroom pallor so common in New England this time of the year, Kit and Bill yelled out in unison as a couple joined for half a century can only do; “Don’t answer it”! But alas, the intruder had left a message…..was it important? Had someone been trying to contact us about a long lost fortune? Did we owe someone money? Was it an old friend trying to reconnect? Was it that relative we don’t like but tolerate for family harmony? Curiosity, having already done in the feline, was looming over our innocent couple as stink looms over a canine deposit. “The area code shows that the call is from California”, bellowed Kit. To which Bill meekly replied, “If it ain’t Ed McMahon…..don’t call back”. Throwing caution to the arctic winds that ripped any residual fall warmth from their quaint New England village, Kit sat in contemplative repose as she listened to the dismembered voice worming into her ear. Bill, becoming increasingly agitated, noticed a smile slowing forming from the corners of her mouth…..a sight he had not visualized in many a year. It’s that RV salesman from California; you know that one that you thought wasn’t as big a bozo as the other half dozen we visited earlier this year? Already regretting what he was about to say, Bill tentatively replied “huh”. The next few seconds would change his simple and uncomplicated life forever as Kit hit re-dial and after a few moments excitedly exclaimed…..yes, yes, yes…..we’ll take it!!!! This my friends is where the Legend of the Expanding RV was born and, a graphic example of how it is indeed possible to “get the cart before the horse”. You see, the lovely Kit had just committed to the purchase of her dream RV, which will be played in this mellow (pun intended) drama by the up-and-coming cart. While homely old Bill suddenly realized that this meant they required a new tow vehicle, being played by the supremely talented horse. So, a few days later, while Kit and her BFF were off playing in the city of Big Apples, Bill went a shopping for a new Tow Vehicle (horse) that would be capable of hauling their new RV (cart). And, (queue trumpets) TaTa…..here she (or insert gender or sexual identity of your preference…..however, what part of TaTa did you not understand?) is! Well, if you haven’t stopped reading yet, and you’re not a motor-head, this might be a great time to visit the Concession Stand as there’s a bunch of truck-speak coming down the road (no pun intended). So, what’s the skinny on that new RV? Stay Tuned……. Hi folks, great to hear from you. 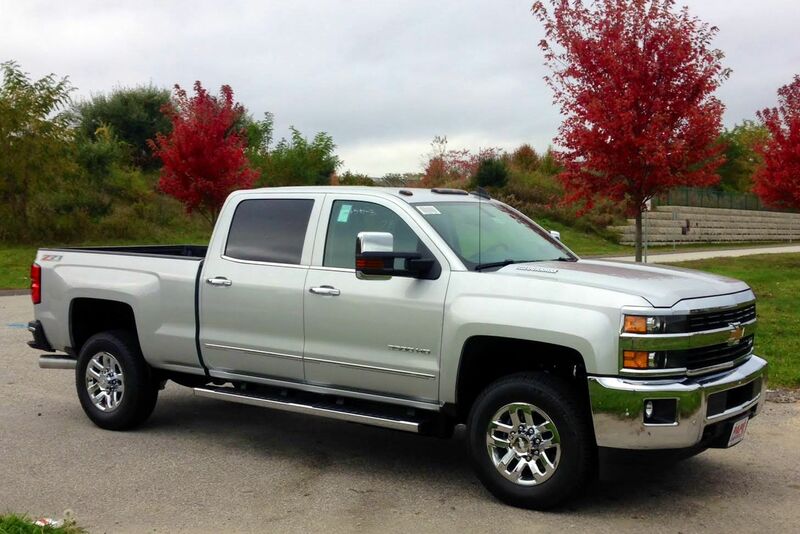 Our experience riding around in your 3500 last winter was one of the reasons we purchased the same…..amazing ride for a one ton truck. Wait until you see the “cart” we have picked out! If we get anywhere near Yuma this trip you can rest assured we will stop by for a visit. Hope you both enjoyed a blessed Christmas and will have a Happy New Year as well. Please stay safe, and in touch! What, no avionics package, heads up display, and afterburner? Drat…..I forgot to add those options! Hope your family enjoyed a blessed Christmas, Happy New Year!!! DID YOU LOOK AT A DODGE???? Yep, noticed a few broke down along side the road as I was test driving the Chevrolet! Actually, I did consider the Dodge, as well as Ford…..both great tow vehicles, however having owned GM trucks since 1972 there is a bit of brand loyalty as well as familiarity involved. Great idea…..I could hang it from a davit attached to the side of the Silverado! Well Bill, we have 2 or 3 of those things on our new 2014 1500 Silverado. But never will it come up to what you guys have got. Good luck on the new home and safe travels. We are in Virginia on our way to Florida. Stay warm (now that was kinda stupid of me). What! New truck!! Details, I need details!!! And photos!!!! Hope you had a great Christmas with family and enjoy an even better New Year!!! Lots more bells and whistles (to say nothing about more power) than my little Chevy ((Malibu Maxx), but I do have heated seats!! And we needed them when we were in VA and WV. Continue to enjoy and we look forward to the day when we can check out the cart in person! Kip and Cathy Paules just bought a new RV. Think they are headed south around February to pick it up at the manufacturer. They’re pretty excited. Like that rig on the top of the blog! Wowza…. hey, I like your new Duramax diesel! That truck is awesome! Hey Bud, great to hear from you and thanks for the comment. So, Kip is getting an RV…..is he retiring as well? Do you know what RV they ordered? Hope you folks enjoyed a blessed Christmas and have a very Happy New Year as well. Stay safe. Gotta ask— Snow Plow Prep Package? That’s the way it came…..however, maybe I could make a few buck plowing sand out here in the west!